The lead-up to Christmas is the peak sales period for the consumer electronics market. To support the sales effort it is important for technology brands to be active with advertising during this time. In Q4 2013 Toshiba looked to do just this with the launch of the Encore, its first 8-inch everyday tablet with Windows 8.1, designed for work and play. Our job with this campaign was to create mass awareness for the Encore and showcase the key product benefits in a way that would generate positivity about the Toshiba brand. What was the strategy for the campaign? TV and outdoor media were fundamental for delivering mass awareness. We focused our budget on a combination of highly impactful, large-format outdoor and audiovisual media, including TV, digital display and cinema. All this was planned and bought by Rocket, to capture attention and demonstrate the work/play functionality of the tablet in a fun and visually captivating way which truly stood us apart from the competition. Why did we use outdoor? It worked in conjunction with cinema and digital to provide excellent, cost-effective, increment­al coverage of a notoriously difficult to reach, light-TV audience. 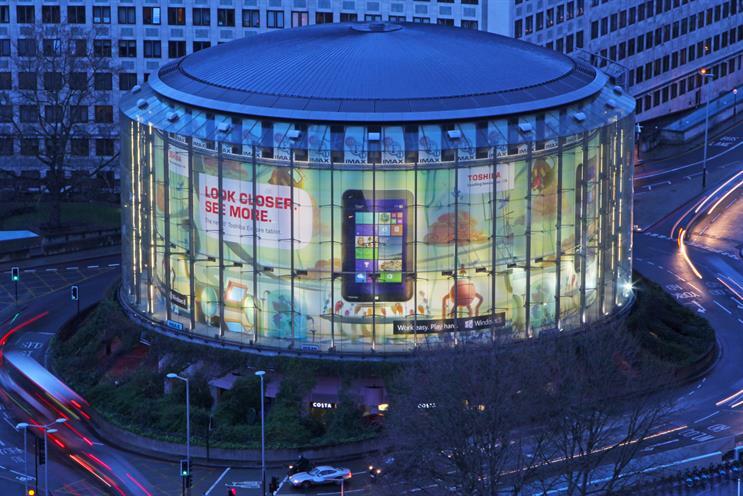 We cherry-picked landmark sites, including Ocean Outdoor’s IMAX banner and GRID network (full-motion, giant digital screens), to add extra scale, stature and distinction to the campaign. The TV creative was translated with stunning effect to grab the full attention of passers-by. Commuter formats were used to capture our professional audience and digital shopping-mall panels provided tactical reminders in proximity to purchase. Importantly, these sites helped to build brand fame and trust, which stamped our position as a major player in the tablet market.